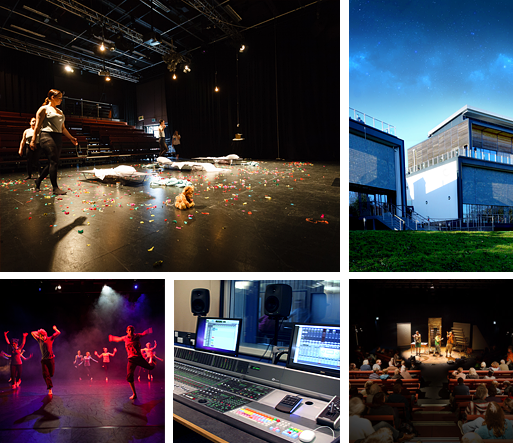 The academy building houses a unique combination of 11 high-specification performance and rehearsal studios, 12 practice rooms, a recording studio complex with both analogue and digital facilities, seminar spaces and an extensive foyer space for exhibitions and displays. These are primarily artistic performance spaces, but are equally adaptable for commercial use as novel conference and presentation opportunities, available for hire outside our teaching and producing schedule. The facilities also include sophisticated lighting and sound infrastructure, four rooms with variable raked seating options and 700m2 of fully sprung dance floors. Click Here to take a virtual 360° tour of AMATA.